In the fasting state, the liver converts excess acetyl-CoA from β-oxidation of fatty acids into the ketone bodies acetoacetate and 3-hydroxybutyrate (β-hydroxybutyrate), which can be used for energy in various tissues. Cardiac and skeletal muscle, and the renal cortex, can metabolize acetoacetate and 3-hydroxybutyrate to acetyl-CoA. During fasting periods, muscle will metabolize ketones as rapidly as the liver releases them, preventing accumulation in the bloodstream. After a week of fasting, ketones reach a concentration in the blood that is high enough for the brain to begin metabolizing them. The processes of ketogenesis and ketolysis are shown in Figure 11.12. Ketone bodies are essentially transportable forms of acetyl-CoA. They are produced by the liver and used by other tissues during prolonged starvation. 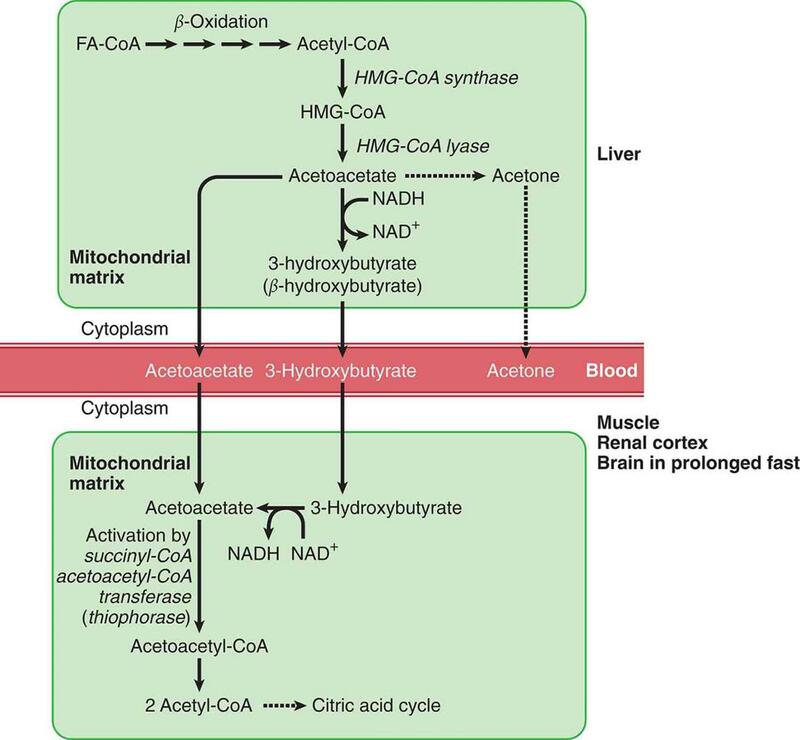 Ketogenesis occurs in the mitochondria of liver cells when excess acetyl-CoA accumulates in the fasting state. HMG-CoA synthase forms HMG-CoA, and HMG-CoA lyase breaks down HMG-CoA into acetoacetate, which can subsequently be reduced to 3-hydroxybutyrate. Acetone is a minor side product that is formed but will not be used as energy for tissues. Acetoacetate picked up from the blood is activated in the mitochondria by succinyl-CoA acetoacetyl-CoA transferase (commonly called thiophorase), an enzyme present only in tissues outside the liver. During this reaction, 3-hydroxybutyrate is oxidized to acetoacetate. The liver lacks this enzyme, so it cannot catabolize the ketone bodies that it produces. A significant increase in ketone levels in the blood can lead to ketoacidosis, a potentially dangerous medical condition. This occurs most often with fatty acid breakdown in type 1 (insulin-dependent) diabetes mellitus. During a prolonged fast (longer than one week), the brain begins to derive up to two-thirds of its energy from ketone bodies. In the brain, when ketones are metabolized to acetyl-CoA, pyruvate dehydrogenase is inhibited. Glycolysis and glucose uptake in the brain decreases. This important switch spares essential protein in the body, which otherwise would be catabolized to form glucose by gluconeogenesis in the liver, and allows the brain to indirectly metabolize fatty acids as ketone bodies. 1. Why are fatty acids used to create ketone bodies instead of creating glucose? 2. What conditions and tissues favor ketogenesis? Ketolysis?